A cancer that’s rarely mentioned or considered when it comes to good overall health is oral cancer. While the topic may get little attention, the American Cancer Society predicts that 51,540 people will get oral cavity or oropharyngeal cancer this year. Of those, nearly 20 percent will die. November is mouth cancer action month. Whether the disease runs in your family or you want to be aware of the warning signs, this is the month to visit your Pawleys Island dentist to gather information and learn how to spot and prevent mouth cancer. The American Cancer Society reports the death rate from mouth cancer has dropped over the past 30 years, but still, 10,030 people will not survive the disease this year. When you launch your search for “dentists near me,” keep in mind that regular visits, like a routine teeth cleaning, is the top way to spot signs of the mouth cancer. Oral cavity and oropharyngeal cancers are twice as common in men as in women. More cases of oropharyngeal cancer have been linked to HPV infection. The average age of most people diagnosed with these cancers is 62. About 25 percent of mouth cancer patients are younger than 55. Routine visits to your Pawleys Island dentist will help you spot changes in the main areas where mouth cancers occur. White and red patches in the mouth. Unusual swelling or lumps in the neck, head or mouth area. Wounds or ulcers in the mouth that don’t heal in two to three weeks. Mouth Cancer Action reports 91 percent of oral cancer diagnoses are caused by lifestyle. Consult with your Pawleys Island dentist about changes you can make to lower your risk. Cheeks: Look for white, red or dark patches. Neck and head: Unusual swelling or lumps. Lips: Sores or change in color in the inner lips. Roof of mouth: Feel for any lumps or sensitive areas. Neck: Use your fingers to feel for any obvious, unexpected lumps. You know your body better than anyone, so while you should be aware of any of these changes, if you notice or feel anything unusual, consult your Pawleys Island dentist. 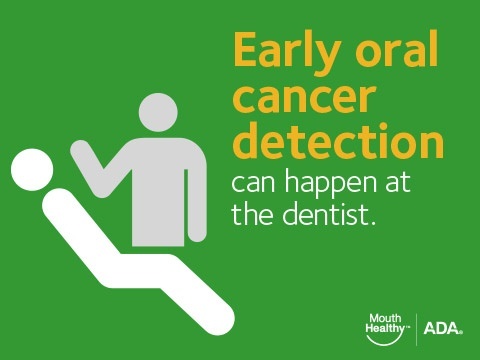 Mouth cancer is treatable but early diagnosis is key.